Georgetown’s Gas Leaks – This website is a resource of information and news about the continuing natural gas pipeline-related leaks and repairs in historic Georegtown, which is the oldest neighborhood in Washington, DC. The photo below is from the natural gas pipeline explosion and fires in San Bruno, California in 2010. A series of natural gas-related explosions and fires hit three Boston suburbs in September 2018. We don’t want Washington to be the next San Bruno or Boston suburbs. This website is a resource of information and news about the continuing natural gas pipeline-related leaks and repairs in historic Georegtown, which is the oldest neighborhood in Washington, DC. 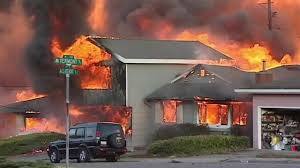 The photo below is from the natural gas pipeline explosion and fires in San Bruno, California in 2010. A series of natural gas-related explosions and fires hit three Boston suburbs in September 2018. We don’t want Washington to be the next San Bruno or Boston suburbs. There have been at least 135 natural gas leaks in DC’s historic Georgetown community since 2016. A majority of the leaks — at least 72 — have been the most dangerous kind as described under Federal guidelines and DC law. Washington Gas has spent $17.8 million since 2016 to fix thousand of gas leaks across the city and has likely spent more than $300,000 to fix gas leaks in Georgetown during that same period. Based on the latest available figures from Washington Gas, there have been more gas leaks in Georgetown than we knew — about three times as many since 2016 than my limited research had originally suggested. Washington Gas now confirms that there were 106 natural gas leaks in Washington DC’s historic Georgetown community between 2016 and sometime in November, 2018. This figure is about 50% higher than previously published reports that were based on my limited research and incomplete figures from Washington Gas. I sought the more comprehensive and detailed information as part of my campaign to require full public disclosure by Washington Gas about Georgetown’s long-standing natural gas leak problem. The updated tally reflects the new data that I requested in November 2018 and received in early December 2018 from the utility company through the DC Office of the People’s Counsel. Because of the new gas leaks that have occurred since November, the unofficial number of gas leaks since 2016 now stands at 135. There is no evidence that Washington Gas has voluntarily informed the community about the number, nature, seriousness, or repair of any of the leaks; under current provisions of DC laws, they do not have to. There have been some highly publicized deadly and destructive natural gas leaks around the country, such as the series of gas leaks and explosions last September in the Boston suburbs. In order to provide the public with confidence and peace of mind about what’s happening under DC streets and sidewalks, Washington Gas Light and the DC government should provide full daily public disclosure about all natural gas leaks and repairs. The DC Public Service Commission, which regulates Washington Gas, held a community hearing on February 6 on natural gas leak reporting requirements. A second hearing will be held on May 15. The Commission indicated that they will hold another hearing on this matter on a date to be announced. Natural gas leaks are labeled according to how serious they are. Grade 1 leaks present an immediate or probable hazard to persons or property, and require immediate repair or continuous action until the conditions are no longer hazardous; grade 2 leaks are recognized as being non-hazardous at the time of detection, but require scheduled repair based on probable future hazard; and grade 3 leaks are non-hazardous at the time of detection and can be reasonably expected to remain non-hazardous. As they reported to the U.S. Department of Transportation, Washington Gas said there was a total of 106 gas leaks between 2016 and part of November 2018. This includes 72 grade 1 leaks, 28 grade 2 leaks, and 6 grade 3 leaks. Because of the number of new leaks that have occurred since November, the final figures for the three year period will be higher. The unofficial tally is 125 as of today. Washington Gas said it does not track and therefore could not provide information about grade 2 leaks that were upgraded to grade 1 leaks in Georgetown. They objected to several of my requests for detailed information about the number, location, and seriousness of gas leaks in Georgetown “on the grounds that it requires the preparation of a special study.” They did not say how I could go about requesting those special studies or if it would conduct those studies if asked. In 2014 there were almost 6,000 natural gas leaks beneath the streets of Washington D.C., according to a study by researchers at Duke and Boston universities and reported by the Washington Post. Until recently we could only speculate how bad the situation is today in Georgetown. We could do nothing but speculate because of the lack of accountability, transparency, and communication by Washington Gas Light (WGL). The utility company makes it impossible for the public to find out how safe — or dangerous — our gas pipelines are, what it is doing to protect and repair the pipelines, or even the frequency and nature of current gas pipeline leaks and repairs. WGL does not communicate with ratepayers and the general public about the repairs or the likelihood of future repairs. On October 19, 2018, Scott Taylor, an investigative reporter with WJLA-TV, started to get some of the truth from Washington Gas: they told him that were 56 natural gas leaks in Georgetown between January 2017 and the day Taylor’s report aired. To see the WJLA story, click here. On November 26, 2018 WRC-TV aired a story as well. Click here to watch it. A record was set in October with at least 5 — and perhaps as many as 8 — new gas leaks on the same day in the same neighborhood. Some intersections, such as Dumbarton and 28th Streets, NW and O and 31st Streets, NW have experienced multiple gas leaks within a matter of days. Public officials have taken no action to address this urgent situation or say they are powerless to do anything about it. News organizations are paying attention, however. Go to the News Coverage page to see more stories about Georgetown’s gas leak saga. A Washington Gas official said on December 3, 2018 that “we have not seen any pattern that indicates there is some systemic issues going on” that would account for the recent gas leaks in Georgetown. “There are different problems,” he said. Price and other Washington Gas officials spoke at a meeting of Advisory Neighborhood Commission 2E that represents Georgetown, Burleith, and Hillandale. Later in the meeting I asked Price why, even though repair crews have worn hazmat-type protective clothing at some gas leaks sites, the community was not told about the potentially dangerous situations. He said there was no need to inform the public because their safety was never at risk. Price did not respond to my follow-up questions about why, in order to assure people about such matters, Washington Gas doesn’t educate the public about its notification policies and protocols or why it does not communicate directly with the public about natural gas leaks. I disputed Price’s claim that Washington Gas places door hanger cards on adjacent houses to inform residents about nearby leak repair work. I said that I have never seen such notices or knew of anyone who has. John O’Brien, Executive Vice President of Strategy and Public Affairs for Washington Gas said, “what I want to say to you tonight is that we can get better at communication. We want to get into a regular program of communication through the ANC.” But he did not provide any specifics or timeline for improving the utility company’s communication with residents or providing them with full daily public disclosure of the growing number of natural gas leaks and repairs in Georgetown. This site is resource for information and updates about the urgent public safety issue of Georgetown’s gas leaks. I launched the site after a series of gas leaks in my neighborhood, seeing news reports about the deadly gas pipeline fires and explosions in the Boston suburbs last September, and my continued frustration with the gas company and their failure to keep my community posted about local natural gas leaks and repairs.